Reflections on the lives of women who challenged the norm. To mark International Women’s Day on Wednesday 8 March 2017, the Public Record Office of Northern Ireland (PRONI) hosted an event which highlighted the lives of a number of extraordinary Irish women. The theme was ‘Be bold for change’, and Amy Carmichael, Margaret Noble and a number of trail-blazing Irish law graduates certainly lived up to this ideal. Three speakers—Iain Niblock, Malachi O’Doherty and Liz Goldthorpe—introduced the audience to these remarkable women. Amy Carmichael was born in Millisle, Co. Down, in 1867, the eldest of seven children. The family moved to Belfast when she was sixteen and there she began her Christian missionary life, which took her to India via London, Japan and Ceylon (Sri Lanka). Iain Niblock shared Carmichael’s story in a documentary, which traced the roots of the Carmichael family from Scotland to Ireland and followed Carmichael from her life evangelising mill girls in Belfast to rescuing ‘temple girls’ in India. Carmichael overcame illness, climate and superstition and established the Dohnavur Fellowship in Tamil Nadu in 1901. The Fellowship rescued girls who were otherwise destined to become temple prostitutes and provided them with shelter, food and education. Carmichael’s work was originally sponsored by the Church of England Zenana Society, though she attracted significant legacies from the wider Anglican community. This money allowed her not only to buy land on which to establish her self-sustainable mission but also to purchase two holiday homes—one in the mountains and one by the sea—for the Fellowship’s many rescued children. Following a fall in 1931, Carmichael was bedridden for the next two decades, and she used this time to campaign against child slavery and published a number of works. She died in 1951, leaving a mission, hospital and school which exist to this day. Niblock shared his experience of meeting the Fellowship’s friends and current staff while filming the documentary. He was fortunate to interview three ladies who had fond memories of Carmichael; one of these, Sarab, simply described Carmichael as ‘the inspiration of my life’. A humble individual, Carmichael shied away from photographs and only a bird-bath marks her grave. Nevertheless, her work not only affected those around her but also led to the outlawing of temple prostitution in India in 1948. Carmichael boldly left Ireland as a single female missionary; her work changed the lives of many. 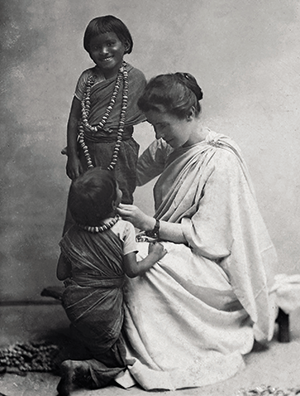 Margaret Noble—or Sister Nivedita, as she was known later in life—was also born in Ireland in 1867, though her life in India took a different path to Carmichael’s. Nivedita was brought up and educated in England, becoming a teacher in her teens. She worked at a number of schools throughout England before establishing her own institution in London. Malachi O’Doherty drew a parallel between Nivedita’s transient early life and her search for spiritual peace. This led her from Anglicanism to Catholicism and Christian Science, before settling on Hinduism when she met Swami Vivekananda, a Hindu monk, in 1895. She followed him to India and joined the Ramakrishna Mission. She became interested in Indian politics and wrote extensively about national and social issues. 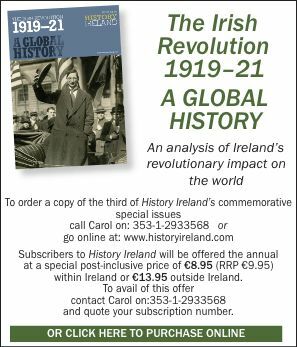 Her ideas and opinions were situated in spiritual nationalism, which O’Doherty likened to those of Patrick Pearse. Inspired by her female predecessors and former colleagues, Liz Goldthorpe has undertaken to write about the first women in the legal profession. Her research has led her to Ireland, a journey paralleled by that of the ‘steamboat ladies’ who travelled from Oxbridge to Trinity College, Dublin, in order to graduate, a privilege denied them in England. In 1888 Letitia Alice Walkington became the first woman in Britain and Ireland to graduate in law, receiving her degree from the Royal University of Ireland. In 1921 Liz Kyle and Averill Deverill were the first women in Britain and Ireland to be called to the Irish bar. Continuing the Indian connection, Goldthorpe shared a little on the life of Margaret Cousins, born in County Roscommon, who became the first female magistrate in India in 1923. While highlighting the achievements of these women, Goldthorpe was careful to list their struggles; Kyle never practised her profession, demonstrating the barriers which these inspirational women continued to face throughout their lives. The International Women’s Day event at PRONI allowed the audience to reflect on the lives of women who challenged the norm: who left Ireland for spiritual vocation in India, who campaigned against social injustices and who fought for the right to be treated as equals. All three speakers commented on the need for further research on the women mentioned. Sarah Hunter was awarded a Ph.D from Trinity College Dublin in 2016 for her study of Irish medical missionaries in India.